We can use our right hand as a map so long as you keep your palm facing the person trying to read the map. (If you happen to suffer from Dyslexia, use your left hand). God made one set and only one set and said, "It is good" and moved on to lesser things. • In Michigan, UP is a place not a direction. It is our northern or Upper Penninsula. Make sure you ask for it that way or you may get something completely different. • We do have mountains - up in the UP - and you can still breath when you reach the summits. They are not the Cascades, Rockies, Ozarks, or Appalachians, but how high does a mountain have be to be a mountain ?? It's hurts just as much to fall off of ours as it does theirs and it's a quicker trip down on ours. FYI: Don't try to climb Mount Elliot, Mount Pleasant, or Mount Clemens. The White Stripes, Stevie Wonder, Kid Rock, Eminem, and Robin Williams. cross the St. Clair River into Canada. Get on the right one or you'll end up on Walpole Island which is an Indian reservation in Canada. But ... when we have everything anyone could want here within Michigan, why leave ?? • The sun shines here every day - it's just that some days you can't see it. • We love ... Faygo, Superman Ice Cream, Better Made Chips, Vernor's, and Mackinaw Island Fudge. • Michigan is one of the few places on earth where you will use both the furnace and air conditioner on the same day. • We use our lakes and rivers all year around. We swim, boat, fish, hunt, camp, and water ski as often as possible. The water temperature doesn't change much summer to winter. • For us the 'wild' life really is wildlife - furry and feathered forest creatures. Forests and lakes are everywhere in Michigan. We don't have allot of animals that will eat you, if you don't count mosquitoes. All of the fish with teeth are illegal immigrants coming in from other places (probably planted by other State Tourism Boards). Your Michigan fishing license does permit you to fish our road potholes but you do so at your own risk. After a big storm many of our main highways become temporary boat launch sites which is convenient for the pot hole fishermen. We only have one poisonous snake in Michigan. The Feds protect him. He is named Massasauga, which means, "Where did he come from?" When out with small pets keep alert for coyotes and hawks who can get testy when they're hungry. • Please take notice: Here in Michigan "soda" is used for baking. Here we drink "pop". • We measure distances in hours and minutes (as in, 'the next rest stop is about 1/2 hour'). We may not be able to make it to work but we still hold school. There's never been a storm so bad in Michigan that we can't make it home. You may notice that the same roads share or change names 2-3 times within a 2-3 mile stretch. The good news is they all generally run East-West or North-South (unless they don't...). Here are a few pronunciation helps you may need. Gratiot is pronounced "Grass'-shut"; not "Grat'-tee-ut". Scheonherr Road is pronounced Shay'-nor, not Show-ner or Shoe-on-hair. Heydenreich Road is pronounced High'-den-rick, not Hey-don-reicht (I know, it may not seem right but that's the way we say it locally). Groesbeck is pronounced Gross'-beck, not Grow-eze-beck or Grow-ess-beck. Now, these pronunciations may not be linguistically correct but if you want us to understand you, you better say them like we do. • M-59 (aka Hall Road) runs east-west until it runs into M-3 / Gratiot turning north-south. Then, what was M-59 is not called Hall Road anymore but becomes William Rosso Highway. • You can go south on North Avenue...but only until you reach M-59 (the Hall Road portion of M-59 that is). South of there it is called M-97 which is also known as North Groesbeck Highway...on which you can also go South - but not East or West..
FYI: There is no South Groesbeck Highway...so we usually just call it Groesbeck. At most major intersections you must turn right to go left ... unless you are entering an Interstate. You'd think the interstates would be easy - but, Nope !!! In most cases when entering an interstate you have to turn left to go in the direction off to your right. I guess that's why they call those interchanges 'clover leafs' - it's the road engineers twisted way of wishing you ... Good Luck ! The state highway, Interstate and freeway numbers and names change often too...but only for short local stretches of distance. For half its distance through Detroit, I-94 East actually runs North toward Port Huron and the Canadian Border. Detroit is the only place in the continental United States where you go south to get to Canada. Just don't cross the Canadian Border without your Passport (or within 2 weeks of having a heart stress test). (Ask us when you see us and we'll explain...). • I-96 = Jeffries Freeway and the Rosa Parks Memorial Highway. • I-375 = runs north and south in downtown Detroit and is also known as, well, I-375. • I-275 = is just good old I-275 (as far as we know). • M-3 = Gratiot Avenue. Up north it changes to M-19. • M-10 = Lodge Freeway. Main Street, Memphis Ridge Road, New Haven Road, Gratiot, and finally Main Street once again. • M-53 = Earl Memorial Highway (never have figured out who Earl was or why we memorialized him by naming a highway after him). county it is one and the same). (once you get off it's like discovering a New World). over in Oakland County. You can go in but who knows where you'll come out. If you leave space between yourself and the car in front of you, someone will fill it. Its a physics law that God built into the universe. We don't typically signal our lane changes or turns so be prepared. Oh, change lanes well in advance of your "intended" exit ramp. Our older drivers tend to travel in the high speed lane .... very slowly. If you check your rear view mirror to see if there is traffic behind you do not be fooled into thinking you are driving a 12 seat limo. Count the number of rear view mirrors you can see in your own mirror, then look for the cars. You're probably looking through the passenger compartment of several other cars. Most of the posted detour routes are also under construction and may have detour detours. Contact the Michigan Department of Transportation at (517) 373-2160 to verify major road construction closures. If you are just interested in a local map check out http://www.michigan.gov/drive . added every mile or so to assist in crossing town. The mile roads - like all the rest have both number names and road names depending on which city or suburb you happen to be in. I've listed some (but not all) of the various names you may encounter as you navigate the Detroit area. The mile road numbers increase as you head north. - a protest against the new math. • 1 Mile = Warren Avenue. • 2 Mile = Joy Road. • 3 Mile = Plymouth Road. • 4 Mile = Schoolcraft Road. 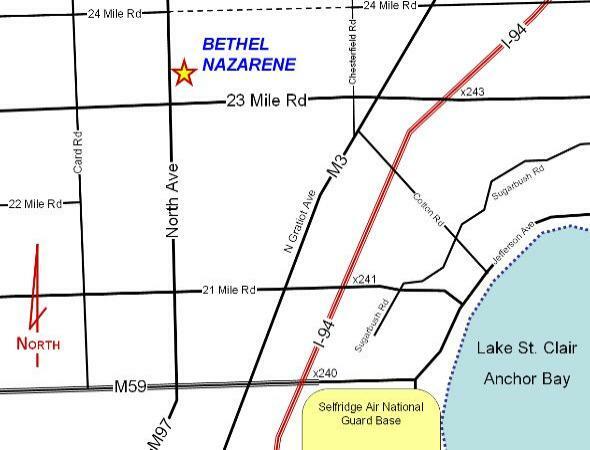 8 Mile is typically the northern border of the City of Detroit. •10 and 11 Mile = have become the I-696 service drive in parts of Macomb and Oakland County. FYI - I-696 has 2 speeds = FULL STOP and GO LIKE YOU'VE BEEN SHOT OUT OF A CANNON - not much in between. There is no "rocket lane" on our roads. We have to go fast in all lanes so as not to fall into the potholes (watch for fishermen). If you're going slower than we are, you are considered a road hazard. You'll get passed left, right and on the shoulder. If you hear a horn, you only have 1 chance in 80 that it is someone saying hello. •16 Mile = Metropolitan Parkway, Big Beaver Road, and Quarton Road. 16 Mile may occasionally be referred to as Nunneley Road, although that is wrong. Nunneley Road is a separate road that actually runs parallel to 16 Mile ... on both sides of 16 Mile. Yes, I said "both sides". FYI: There is a road called North River Road and another called South River Road both of which tend to follow the meandering of the Clinton River. There is also a road called Clinton River Road which does not closely follow any river at all. •20 Mile = It's never really called 20 Mile but rather M-59, Hall Road, William Rosso Highway or South Blvd. The mile roads "go for miles"... If you get to 34 Mile, give it up. Find an apple orchard, pull in and have a piece of pie and a cup of coffee. Then go get a room, get some rest and try again tomorrow. Don't consider the day a loss however. At least you'll know where to get some great coffee and pie. If you do get lost, count to 10 and thank God you're ultimately going to Heaven (at least we hope you are). The really good news (for those who are going) is that Jesus is coming to pick us up. We don't have to drive and won't need a map! Until then - if you get lost - give us a call. As long as you know where you are, (and can pronounce it so we recognize it), we can guide you to Bethel. and once you're here, we can even show you the way to Heaven ! Road 4 miles to the west. between Bethel and Hall Road - M59. the others but - no guarantees. south toward Hall Road - M59. Road. Don't let the signs confuse you. for 10 miles takes you to Lakeside Mall. head west on 23 Mile Rd for ~ 3 mi. onto North Ave for 3 1/4 miles. Note: This page refreshes automatically every 15 minutes. New to Michigan? Unfamiliar with the area? March 2018. Data in 2017 dollars.